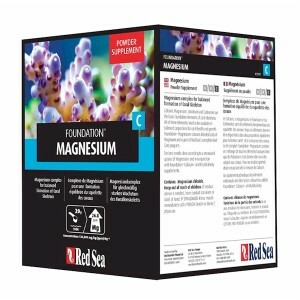 Reef Foundation C contains blended salts of magnesium and is part of Red Sea’s complete Reef Care Program. 1g will raise the Mg level of 100 liters by 1.34ppm. Robust coral skeletons are essential for all reefs and only achievable by ensuring the basic elements Calcium, Magnesium, Strontium and Carbonate are readily available and in the correct ratio to each other. If they are not in the correct ration the coral skeleton can form as a fragile calcite. Can also be used as part of the Stage 1 - Reef Foundation in the Red Sea Reef Care Program. The Reef Foundation Stage provides a complete solution for testing and supplementing these foundation elements and allows the reef-keeper to take control of their aquarium. This product is part of the new Red Sea unique Reef Care Program (RCP). The Red Sea reef care program is the result of over 5 years research from Red Sea scientists resulting in unparalleled understanding of the requirements of coral aquariums. The Red Sea Reef Care Program provides a holistic solution to maintaining a flourishing coral reef aquarium. It even allows beginners to achieve stunning sps aquariums safely. We aim to dispatch all orders the same working day provided it is received before 4pm and payment confirmed, subject to stock availability. Orders received after this time may not be dispatched until the next working day. In the unlikely event of an item being out of stock, we will contact you via email to advise you of an estimated delivery date, to give you the option of cancelling or waiting. Small and lightweight items (below 2kg) will normally be sent via Royal Mail 1st class, and should be delivered within 5 days, usually next day. Larger orders with a total weight over 2kg will normally be sent via parcel carrier for delivery within 2 working days. Any orders placed after 11am on Saturday will be dispatched on Monday. If the order is placed over a bank holiday it cannot be dispatched until the first working day. We reserve the right to use the most cost effective service to get your order to you as quickly as possible. For more details, see delivery and returns in the side menu.